GDACS issued a ORANGE alert for this dangerous earthquake (if data is confirmed). The depth of 34 km is shallow enough to cause problems. The earthquake happened in the middle of the New Zealand night. USGS has just improved his readings with an epicenter 30 km from Christchurch, but with a shallow depth op only 16 km. GDACS calculations are giving a local tsunami in the immediate vicinity of the epicenter of 30 cm. USGS gas decreased the Magnitude to M 7.2, better but still violent. Christchurch is one the worst places an earthquake can strike. As it is in the middle of the night and as the power is out in big parts of the South Island, Only small portions of information come out of the epicenter area. Update 18:00 UTC : Epicenter has been relocated to Springbank and Rangiora, both farming communities. Local newspapers have no reports so far on what is going on. Update 18:09 UTC : Reuters Alertnet reports : no casualties but widespread reports of damage, authorities said. Read the full report. 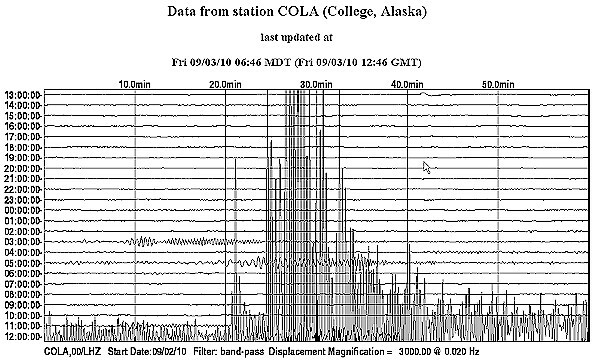 Earthquake-report.com comment : it is far to early to have adequate readings on the damage and injuries as it is night and as it will take a couple of hours before all data can be broyght together. Update 18:18 UTC : Susan Mary Ross reports from Christchurch (via our facebook site) : That’s the biggest I can recall in 50 years. We lost many special plates and crocery that rocked of the shelves and a Don Binney print fell from the wall smashing its glass. Furniture and boxes fell the place looks like a bomb site. Puppy is cowering under my desk and won’t come out. Luck…y it wasn’t much worse and just seems to be damage to property. Hope all is well it everyone else. Blessings! Update 18:20 UTC : Power is completely out in NOrthern Christchurch (the epicenter of the quake is 30 km north of Christchurch). Almost all houses have broken glass, china, etc. Civil Defense department will soon decide whether to call a National Crisis. 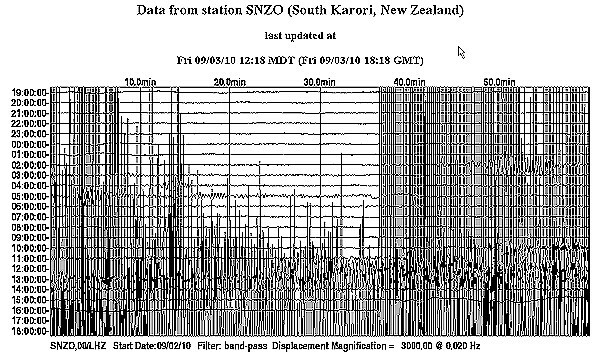 The present earthquake is one of the biggest earthquakes in recorded history on the South Island. The quake has been felt as far as Wellington. Update 18:47 UTC : Magnitude has been further downgraded to M 7.0 (a big difference with 7.4). New depth is 12 km (source USGS). Update 18:56 UTC : we have renewed all the links of the important maps as after recalculation, the coordinates, epicenter etc. have been changed. The most importnat now is to find out the damaga en eventual injuries in Waddington, Springfield, Annat and Sheffield. Based on this report and other fractioned reports found on many places on the internet : the damage is far greater than initially admitted. Another 2 or 3 hours will be needed to have a better view on the impact. Update 19:03 UTC : Limited damage reported in South Canterbury. Testimony of Jasmine Erridge : the ceiling caved in on my son while he was asleep in his bed… thank god he’s ok, im ok, familys ok. thank goodness have just moved and hadnt had a chance to hang heavy stuff on the wall yet!! Christchurch airport has been closed until further notice. People are asked NOT to use their cell phones to avaoid overloading the network. Railway system is being checked for damage and trains are temporarily halted in the area. So far no casualties, only some injured people. Update 20:16 UTC : A lot of cars are being damaged by falling bricks. So far only reports of Christchurch. Still no word on the epicenter villages. Update 20:58 UTC : So far hospitals only have received a couple of seriously injured people and a number of minor injuries. Civil Defence is organizing Emergency Management Centers. Christchurch’s Avonside Drive has been seriously damaged. 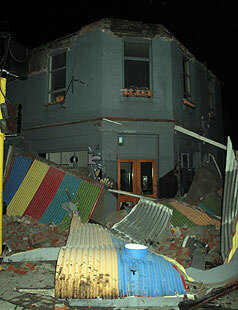 Older buildings in the Sydenham suburb have collapsed. 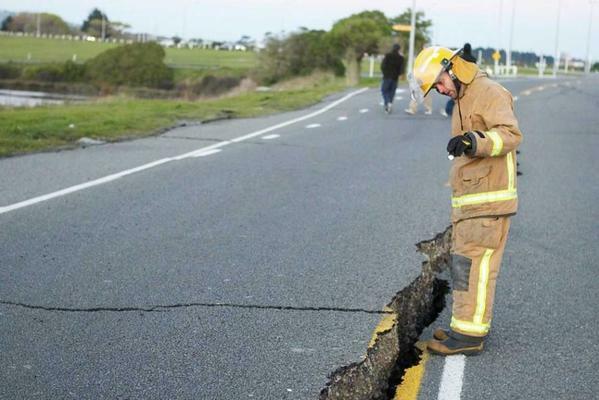 Earthquake report comment : all the news we get at the moment comes from Christchurch, about 55 km from the epicenter. Until now no report yet on the epicenter villages. Darfield resident Meg Morten said the earthquake was preceded by a ”huge noise” that jolted her from her sleep. Earthquake-report.com was one of the first worldwide to report in-depth about this massive earthquake. Follow us on twitter or in Facebook. Update 20:58 UTC : Power is still down in rural Canterbury. Most of the injured people have glass cuts (from broken windows) and broken bones. Aftershocks are still going on and will continue for days and even weeks. People in Christchurch and surrounding areas will have to get used on these aftershocks, just as the Chile people had to after the M 8.8 earthquake from February 27. Update 21:20 UTC : Seaside suburb on standby to evacuate as flooding may be possible. As most of the Cell Phone towers are running on batteries since the earthquake struck, they will do down within a couple of hours. Press reporters say there has been widespread damage to buildings on the corner of Edgeware Road and Barbados Steet, with rubble lying on the road and properties badly damaged. Update 21:57 UTC : The port of Lyttelton has major damage . Cost will run into the millions. State of emergency declared by Bob Parker in last few minutes. Some residents asked to prepare for evacuation due to flooding and sewerage problems. State of Civil Emergency will be declared by John Carter very soon. SAR (Search and Rescue teams) are still searching for people in collapsed houses. So far no casualties, only injured. Update 23:52 UTC : Urban Search and Rescue teams are being flown from the North Island to help with the assessment process. One person in intensive care after being crushed by a crumbling chimney. Earlier reports of looting were exaggerated. City center closed to people not living in that area. Major damage reported in the historic town of Lyttelton. The earthquake struck at approx. 2 AM in the morning. With a depth of 51 km, the impact will be a strong shaking in the vicinity of the epicenter. Adak island is one of the most remote localities in the USA. Adak, the capital of the Andreanof Islands had a population of 316 during the latest census. Adak is located at the other side of Adak Island at a distance of 45 km from the epicenter. There are no radio stations in Adak and no stations even 200 mi away. The only radio stations that can be received in Adak are through satellite or shortwave receivers. In a radius of 200 km around the epicenter, only small settlements can be found. This area of our planet has numerous moderate earthquakes. The current earthquake is however a major one, and occurred almost under the island. It is too early to report on damage or injuries. We will keep you updated. 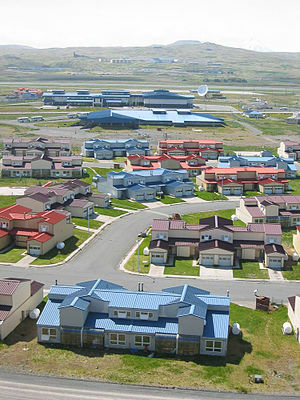 Adak’s airport is one of the largest and most sophisticated airports in the Aleutian Islands. Built by the U.S. Navy for Naval air transport, the airport is a world-class facility consisting of a 7,800-foot (2,400 m) runway and a 7,600-foot (2,300 m) runway, equipped with an Instrument Landing System and glideslope which facilitate Instrument Flight Rules landings. Adak currently has scheduled jet service provided by Alaska Airlines. The Andreanof Islands are a group of islands in the Aleutian Islands in southwest Alaska. They are located between Amchitka Pass and the Rat Islands group to the west, and Amukta Pass and the Islands of Four Mountains group to the east. The islands extend about 275 miles (440 km). The total land area of all islands (including the Delarof Islands) is 1,515.349 sq mi (3,924.737 km²). The total population was 412 persons as of the 2000 census, the vast majority in the city of Adak on Adak Island. Irna, the Islamic Republic News Agency reports that in the Damghan area a 4 year old child and an infant were killed and 17 were injured. The quake has damaged the villages of Kohzar (Kuh Zar) , Shimi (Shemi) and Kelo. These villages are approximately 3 to 5 km from the epicenter. Since the main tremor, 5 aftershocks have jolted the area. Luckily the epicenter area is scarcely populated. Shallow earthquakes in Iran can be very damaging. GDACS has issued a GREEN earthquake report shortly after the earthquake. Maximum expected shaking in a radius of 25 km around the epicenter will be VI Mercalli = strong shaking. As houses are NOT earthquake proof in Iran, and earthquake of this magnitude is mostly very dangerous. The earthquake was felt until Tehran, 285 km from the epicenter. There are NO nuclear installations or hydrodams in the epicenter area. Local agencies are reporting a Magnitude of 5.9. The earthquake struck south of Damghan city in the desert area of Dasht-e-Kavir. Damghan City has a population of 67,694 and is located about 81 km from the epicenter. Iran is criss-crossed with fault lines and is regularly hit by earthquakes, experiencing at least one slight tremor every day on average. The worst in recent times hit Bam in southeastern Kerman province in December 2003, killing 31,000 people – about a quarter of its population – and destroying the city’s ancient mud-built citadel. The deadliest quake in the country was in June 1990 and measured 7.7 on the Richter scale. About 37,000 people were killed and more than 100,000 injured in the northwestern provinces of Gilan and Zanjan. It devastated 27 towns and about 1,870 villages. A strong shallow seaquake struck right on the fault line where the Pacific plate and the smaller Cocos plate collide. The epicenter was though on a safe distance of almost 300 km out of the Mexican coast. The earthquake was felt by some as a weak shaking, with of course no damage or injuries. In this area, it is not the main fault line where today’s earthquake occurred (collision of Pacific and Cocos plate) which causes the highest risk, but the fault line closer to the coast where the Cocos plate and/or the smaller Rivera plate subducts under the North American plate (the steep sea ridge can clearly be seen on the Google satellite map and on the above fault line map). The biggest movement comes from the Cocos plate who travels at a rate of 40 mm/year under the North American plate. On January 22, 2003 a large massive earthquake struck the coastal waters only 50 km from Manzanillo. This earthquake was also called the Colima earthquake (area name). At least 29 people killed, 300 injured, about 10,000 homeless, 2,005 houses destroyed and 6,615 damaged. Most of the deaths and damage occurred in the Villa de Alvarez-Colima area. Extensive damage (VIII) at Colima and Tecoman. Landslides closed a segment of the Colima-Guadalajara Highway and the port at Manzanillo. A local tsunami of about 1 m was recorded at Manzanillo. The most deadly earthquake in the region occurred about 170 km to the south-east on September 19, 1985. This magnitude 8.0 earthquake (also called the Michoacan earthquake) killed at least 9,500 people, injured about 30,000, and left 100,000 people homeless. No general Tsunami risk (local smaller tsunamis are always possible). NO people live in an area of 25 km around the epicenter. 27,800 people live in an area of 50 km around the epicenter. 110,000 people live in an area of 100 km around the epicenter. 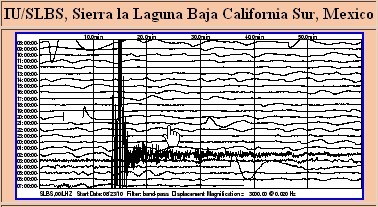 We have enclosed the seismogram of this earthquake to give you an idea of the travel time of the wave in the earth. We monitor tens of stations all around the globe and the Chiang Mai, Thailand station was the closest we could find. The signal arrived in Chiang Mai roughly 4 minutes after the earthquake struck and traveled a distance of 1850 km. The magnitude of the Papua New Guinea quake was 6.4, a lot stronger, but because of the greater distance, the markings on the seismogram in Chiang Mai are smaller. A rather deep (51 km) earthquake occurred in the Solomon Sea at a reasonable distance from the Bougainville Island coast. 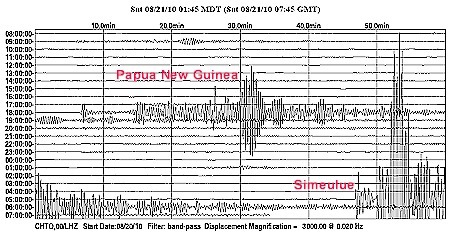 Papua New Guinea has almost daily earthquakes and this one has only a limited chance on damage and injuries. The main danger of these earthquakes are local, sometimes devastating tsunamis, triggered bu undersea landslides. A good look on the satllite Google map will reveal an epicenter just on the steep ridge where one of the 2 plates is subducting the other. This earthquake happened in the middle of the night (4 AM). On the positive side, GDACS has issued a GREEN earthquake report. 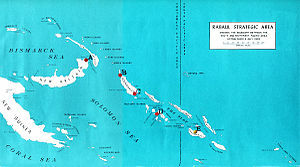 Bougainville island is part of the Pacific Ring of Fire. The Pacific Ring of Fire (or sometimes just the Ring of Fire) is an area where large numbers of earthquakes and volcanic eruptions occur in the basin of the Pacific Ocean. In a 40,000 km (25,000 mi) horseshoe shape, it is associated with a nearly continuous series of oceanic trenches, volcanic arcs, and volcanic belts and/or plate movements. The Ring of Fire has 452 volcanoes and is home to over 75% of the world’s active and dormant volcanoes.